Well we left the marina for a week out on the cut. Last Friday was my works Christmas Dinner do at the Coconut Grove Indian resuarant in Chester. Now this restaurant is just round the corner from Harker's pub. Boaters that have visited Chester will know Harker's fronts the canal here in Chester so to save a breathalyser and taxi fares I slipped mooring lines on Friday morning and moored up in Chester outside the new Waitrose. Chris was at work I single handed AmyJo as far as Eggbridge near Waverton and was then joined by my good friend Dave who helped me work AmyJo down the locks. Many thanks Dave. Stopping in Chester for the weekend meant I could enjoy a beer or 4 without worrying about transport home. In fact, oddly, until late Saturday afternoon AmyJo was the only boat in town upstream of the winding whole, we had the cut totally to ourselves. I have to say the food at the Coconut Grove was OK being more traditional Indian cousine but personally I still prefer the Barton Rouge. 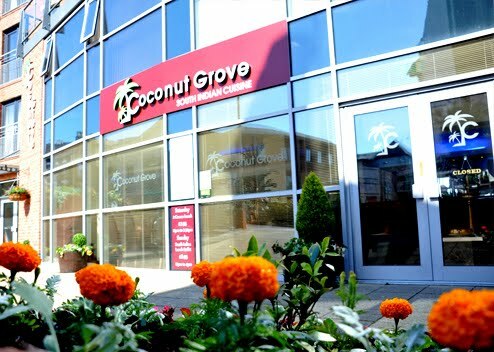 Nothing wrong with Coconut Grove food mind, in fact it is really nice and well presented. Its just I'm not a great lover of Indian food so its that I enjoyed the atmosphere more in the Barton Rouge. As we did last year, we made good use of the weekend to do all our Christmas shopping in town, once more beating the queues for the now diminishing car parks (the big open air, Gore stacks, car park now given over to re-development of a new bus terminus). Whilst car parks seem to be disappearing in town the Christmas market has grown in size and looks great. Loads more to see and sample than last year. We spent the whole day in town and managed to get all the gifts we intended to buy. The bank manager's smile now replaced with a frown. It was nice to get back to the warmth of AmyJo and put our feet up though. We stayed out for the week this time as Chris's last day of school term was on Wednesday and they were all booked into the Cheshire Cat for meal at lunchtime. We took the oppotunity to move AmyJo to the moorings outside the Cheshire Cat and again found, apart from one other boat, that we had the moorings to ourselves. This meant it was Chris's turn not to have to worry about taxi's or parking. I do confess we have been really naughty by overstaying on the mooring and its not a habit we intend to adopt, but, as only one other boat had stopped all week there was still plenty of mooring space available. We would have moved on if this was summer and traffic on the cut was busier. Being both at work its too dark when we get home to cruise so we had no real choice but to stay or cruise in the dark, not something we wanted to do nor felt comfortable with. One could argue we should have stopped in the marina but we do hope we have put anyone out by staying just this once. The girls Chris works with all wanted to see AmyJo for themselves after their meal and at one point all 12 were aboard. I'm so glad I was at work at the time :-) Chris did say she had to marshall them carefully for fear of sinking the boat. It must have been interesting showing them all around and maintaining boat trim (not that I'm implying any deference to their size by the way). In hind sight having this many aboard was a tad foolish but AmyJo coped quite well and she's still afloat so no harm done. The good news is our new AGM batteries are holding up well and we only run the engine for an hour or two in the evening to top them up but mostly to give us hot water. Tuesday night we gave them a boost charge using the travel pack whilst running the engine. At 1.5KV output the travel pack fools the invertor into thinking we are on mains so it charges through the normal bulk, absorbsion and float cycles when on mains so this helps top the batteries right up and condition them. Despite the poor weather even the solar panels are putting a small charge in, though nowhere near enough to keep the batteries topped up, but as a certain advert tells us, every little helps. What is it with this weather? First weeks of wind making 2015 the windiest year so far, then heavy rain almost making it the wettest, now unseasonally high temperatures are likely to make this winter the warmest on record. I guess if you wanted evidence of global warming surely this must be it. So all that is left to say is have a very Merry Christmas to all our readers and hope you have a fantastic festive season. May you can your family enjoy good health and happiness in the coming year. And a very Happy Christmas to you two from Jan and me on NB Jubilee. Don't worry about overstaying on visitor moorings - they are all 14 days over winter (unless they have a special sign on them). Hope you had a great Christmas onboard and hope to catch up with you again sometime!